APC’s SMT1500I is part of the award winning Smart-UPS family which is the most popular UPS in the world for servers, storage and networks. The 1000W 1500VA UPS is trusted to protect critical data and equipment from power problems, and supplies clean and reliable network-grade power. In addition to legendary reliability and manageability, Smart-UPS units have extremely high efficiency at low, medium and high load levels, making them ideal for today’s multi-core or virtualized servers that have varying load consumption. 1. Alphanumeric LCD (Liquid Crystal Display) - Intuitive interface provides detailed and accurate information with the ability to configure locally. 2. Communication Ports - Serial, USB, and SmartSlot™ for accessory cards. 5. Push Button Circuit Breaker - enables quick recovery from overloads. 6. Network-Grade Power - Provides most stable power conditions by filtering noise, automatic voltage regulation (AVR), and surge protection. 7. High Efficiency Green Mode - Saves utility costs and reduces heat promoting longer component life. 8. Advanced Battery Management - Temperature-compensated charging extends life and advanced algorithms recommend replacement date. LCD Display Screen - Clear, consistent, and detailed information in your choice of basic or advanced menus. Online Status Indicators - Online, on battery, fault, and replace battery LEDs for quick status identification. Escape - Exits to the previous menu or screen. Return - Used to enter or confirm settings. Navigation Arrows - Allow for quick adjustment of settings. The next generation of Smart-UPS™ now boast an ingenious connectivity feature that makes Smart-UPS even more adaptable and even easier to deploy. APC™ SmartConnect is an enabling feature that allows customers to view the status of their UPS through a secure web portal. Through this innovative remote management interface, customers will receive automatic notifications, firmware updates, and advanced support. APC SmartConnect's easy-to-use network connectivity provides added value, and more importantly, added peace of mind. Advice from the experts: Connected Smart-UPS routinely provides proactive UPS lifecycle recommendations, helping maximize the lifespan of your APC UPS. Accessibility: The APC SmartConnect web portal is accessible from any internet connected device. You'll be able to check on your IT equipment on site or on the go. Enabled as a standard: APC SmartConnect will be automatically included on select Smart-UPS models; making it the perfect solution for price-conscious professionals in need of power security. Seamless integration: Easily integrate with leading remote monitoring and management solutions, so you can manage customer portfolios in a single platform. APC’s SMT1500RMI2U is part of the award winning Smart-UPS family which is the most popular UPS in the world for servers, storage and networks. The 2U rackmount 1000W 1500VA UPS is trusted to protect critical data and equipment from power problems, and supplies clean and reliable network-grade power. In addition to legendary reliability and manageability, Smart-UPS units have extremely high efficiency at low, medium and high load levels, making them ideal for today’s multi-core or virtualized servers that have varying load consumption. 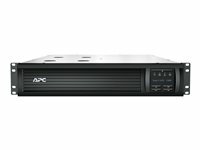 APC’s SMT1500RMI1U is part of the award winning Smart-UPS family which is the most popular UPS in the world for servers, storage and networks. The 1U rackmount 1000W 1500VA UPS is trusted to protect critical data and equipment from power problems, and supplies clean and reliable network-grade power. In addition to legendary reliability and manageability, Smart-UPS units have extremely high efficiency at low, medium and high load levels, making them ideal for today’s multi-core or virtualized servers that have varying load consumption. 4. Push Button Circuit Breaker - enables quick recovery from overloads. 5. Network-Grade Power - Provides most stable power conditions by filtering noise, automatic voltage regulation (AVR), and surge protection. 6. High Efficiency Green Mode - Saves utility costs and reduces heat promoting longer component life. 7. Advanced Battery Management - Temperature-compensated charging extends life and advanced algorithms recommend replacement date. 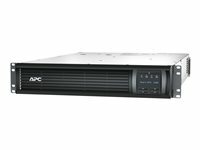 APC’s SMT2200I is part of the award winning Smart-UPS family which is the most popular UPS in the world for servers, storage and networks. The 1980W 2200VA UPS is trusted to protect critical data and equipment from power problems, and supplies clean and reliable network-grade power. In addition to legendary reliability and manageability, Smart-UPS units have extremely high efficiency at low, medium and high load levels, making them ideal for today’s multi-core or virtualized servers that have varying load consumption. APC’s SMT1500RMI2UNC is part of the award winning Smart-UPS family which is the most popular UPS in the world for servers, storage and networks. APC UPS network management cards allow for secure monitoring and control of an individual APC UPS via web browser, command line interface or SNMP. Embedded technology provides exceptional reliability with notification features that inform you of problems as they occur. Command line interface - Offers simultaneous remote management access through Telnet and SSH. IPv6 Support - Capable of operating on a network using IPv6 protocol. Standard UPS RFC 1628 MIB Compatible - Make UPS information available to your preferred network, server or enterprise management system by forwarding SNMP traps (events) using RFC 1628 MIB. Device Encryption - Securely connect via HTTPS/SSL, SSH (up to 2048-bit encryption), SNMPv3. Multiple language support - Web browser interface available in English, German, Russian, Simplified Chinese & Japanese. Multiple user access - Supports simultaneous web browser access for up to 8 users and network command line interface access for up to 3 users. UPS Firmware Update - User friendly mechanism to remotely and seamlessly update UPS firmware via the web browser interface (SMX, SMT and SRT Smart-UPS only). Smart Battery Management Support - Detailed battery information including battery cartridge parameters provides early-warning fault analysis to simplify management of the entire battery system (SRT Smart-UPS only). Modbus TCP Support - Supports reporting UPS information to Building Management Systems or other third party management systems via Modbus TCP. APC’s SMT2200RMI2U is part of the award winning Smart-UPS family which is the most popular UPS in the world for servers, storage and networks. The 2U rackmount 1980W 2200VA UPS is trusted to protect critical data and equipment from power problems, and supplies clean and reliable network-grade power. In addition to legendary reliability and manageability, Smart-UPS units have extremely high efficiency at low, medium and high load levels, making them ideal for today’s multi-core or virtualized servers that have varying load consumption. APC’s SMT2200RMI2UNC is part of the award winning Smart-UPS family which is the most popular UPS in the world for servers, storage and networks. Includes: CD with software, Documentation CD, Installation guide, Rack mounting hardware, Rack Mounting support rails, Smart UPS signalling RS-232 cable, USB cable. • Alphanumeric LCD (Liquid Crystal Display) - Intuitive interface provides detailed and accurate information with the ability to configure locally. • Communication Ports - Serial, USB, and SmartSlot™ for accessory cards. • Push Button Circuit Breaker - enables quick recovery from overloads. • Network-grade Power - Provides most stable power conditions by filtering noise, automatic voltage regulation (AVR), and surge protection. • High Efficiency Green Mode - Saves utility costs and reduces heat promoting longer component life. APC’s SMT2200RMI2UC is part of the award winning Smart-UPS family which is the most popular UPS in the world for servers, storage and networks.